This is the first part of the cat where actually cutting will take place. 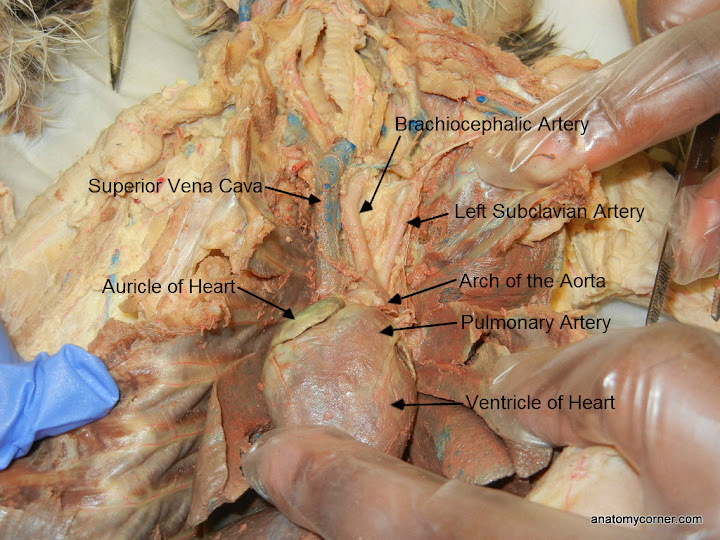 Students will need to open the thoracic (chest) cavity to reveal the heart and its attached vessels. The best tool for this job is a scalpel and bone cutters to break the sternum. Once the heart is revealed, you can identify the vessels that attach to it. When dealing with the circulatory system, it is best to think of the vessels like a road map, one vessel leads to another with branches into these two vessels…etc. The cats have been injected with colored latex to make identifying the vessels easier. The arteries will have a pink color and the veins will have a blue color. This photo shows the main vessels that attach to the heart. Here, the pericardium, the membranous sac that surround the heart, has been removed. To see the vessels that attach to the back of the heart, it is not necessary to remove the heart entirely (in fact, this can make it even more difficult to find the vessels, so removal of the heart at this point is not advised). Push the heart to the side so that you can see where the inferior and superior vena cava enter the right atrium of the heart. If you follow the vena cava up from the heart, it branches into several small vessels that drain blood from the head and brain. (Remember that veins return blood to the heart and arteries carry blood away from the heart.). The brachiocephalic artery branches into the two common carotids which supply blood to the head. You can also expose more vessels of the face and head by teasing away the tissue of the brachiocephalic vein and tracing its path upwards. The aorta branches off the top of the heart in an arch and then travels downward to become the thoracic and then the abdominal aorta. The inferior vena cava runs parallel to the abdominal aorta. Each will branch on their way down to connect to various structures. 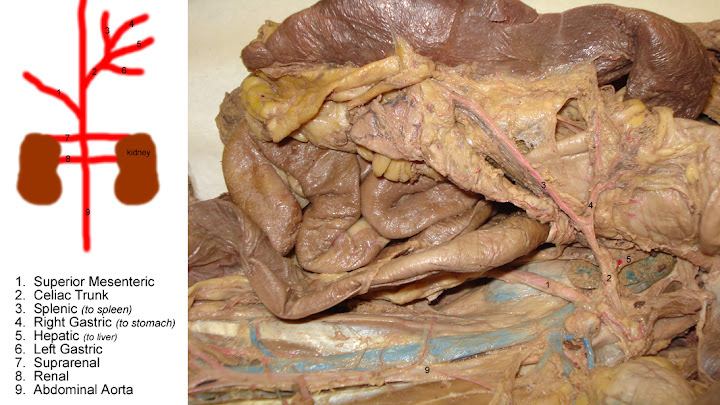 These branches are often named for the organs they connect to, as in this photo showing the splenic (to spleen), the gastric (to stomach), and the mesenteric (to mesentery of small intestine). The renal vessels are easy to find if you locate the kidneys. These two large vessels connect the kidney to the aorta and inferior vena cava. They are large vessels because of the important job the kidney has filtering toxins from the blood. At the lower abdomen the aorta makes a “Y” where it splits into the external iliac arteries. A similar split occurs in the inferior vena cava. The iliac arteries are named after the bone they cross (the ileum of the pelvis). When they enter the leg, the external iliac arteries become the femoral arteries as they follow the femur. 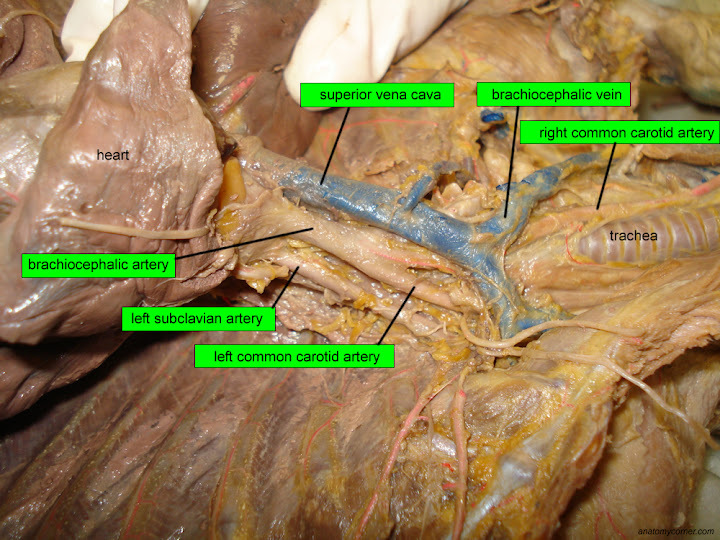 On this photo, the iliac arteries are visible as they are more superficial. The iliac veins lie behind them and run parallel.